Two games back to back against divisional rivals on the road, and the Penguins are 2-0. There are a lot of positives to take away from the opening weekend of the season. However there are a few things Shero, Disco Dan and the rest of us should keep an eye on as the season moves forward. I know, right? This was a guy for the past two seasons Penguins fans have turned into the team's whipping boy. Now all of a sudden he's a shutdown defenseman? Through two games, yeah he kinda is. Through the weekend, Martin is second on the team in assists (3) and is tied for second on the team in points (3). UPDATE: NHL officials Monday afternoon changed the Tyler Kennedy goal from Saturday to Martin's goal. (Martin is now 1G, 2A on the season, Kennedy just 1G). Martin just looks different out there. More confident. He's making smart clearing passes, finding the open guy and actually keeping the puck in front of him on defense. Maybe all that needed to happen was get rid of Zbynek Michalek. Maybe he's finally found a fit with a defenseman pair in Brooks Orpik he gels with. Either way, this isn't the Paul Martin we've become accustom to and that should sit just fine. Talk about a well oiled machine, but the Penguins power play is firing on all cylinders. Penguins are a solid 50% (4 of 8) with the other team down a man, picking up right where they left off last regular season. The team's puck movement, spacing and finding passing lanes is something special. Here's how James Neal found his PPG from last night. Great spacing, and even better passing. Especially with Malkin finding Neal open in the slot. 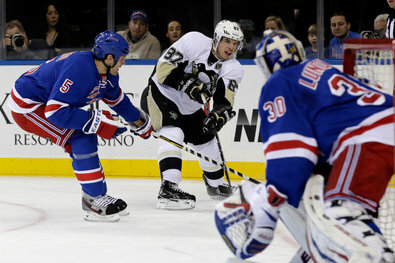 Rangers looked lost trying to defend the Pens' top power play line. Here's the other power play goal from last night. That's just sick passing all around. Puck possession has been huge for the Penguins through the start of the season. They seem in their element when on the man advantage and are able to make the most of the opportunity half the time. Strong numbers that hopefully will stick for the remainder of the season. Brandon Sutter made a great impression over the weekend. Great effort on the PK breaking up passes and solid two-way play pushing the puck up offensively. Welcome aboard Brandon. Many fans described Evgeni Malkin's play thus far as though he's on bath salts. I'd agree. He's playing on a completely different level, even without a goal yet. James Neal not skipping a beat with three goals in two games. Tyler Kennedy and his two goals on three shots. MAF on stopping all but one of the 28 shots he faced at Philadelphia. So much hype surrounded Sidney Crosby coming into a season completely healthy and what he could be capable of. So far, it's just one assist and eight shots. He's definitely still a major factor out there for other teams to watch, but I think we could all agree we're a little surprised he hasn't put up more than one measly point. From a physicality point, Sid is throwing his body around for sure. He laid one solid check last night the broadcasters on MSG tried not to make a big deal, but it was a huge hit. The goals and points will come for Sid, it's just a slower start than expected. There has been plenty to get excited about so far with young defenseman Simon Despres. He's taking his time making sharp passes and for the most part standing guys up at the blue line. Why I have him listed here is because we need to remember he's still young and he's going to make mistakes. There were a couple times over the weekend Despres made bonehead passes to the opposing team, or tried clearing up the middle of the ice. 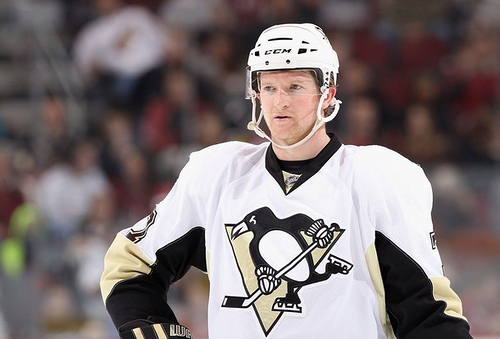 He's also found himself beat a couple times, costing him and the Penguins two minor penalties. Nothing to get worked up over, just pointing out while Despres has shown us some solid play there is still some things he'll need to sharpen to stay competitive at the NHL level. Tomas Vokoun made some fantastic saves last night in his Penguins debut. His play of the puck behind the net was impressive. There were a few times it looked like he had a tough time handling shots and tracking the puck. He still got the win. Also, what was going through Malkin's mind on this turnover? Yikes. Less of that please. Where to begin... Look, full disclosure I'm a firm believer Beau Bennett was screwed by not getting this spot on the roster. And I think I have a lot more followers who stand behind my beliefs after witnessing Eric Tangradi simply float around on that second line like a plastic grocery bag in the wind. Tangradi was hardly ever in the play. Ever. I finally saw him last night when he got pushed over at center ice, fell into Malkin, and he fell over too like dominoes. That and when he got chippy late in the game and drew a penalty. I'm not even sure he made the trip to Philadelphia. THIS IS THE GUY WINGING MALKIN AND NEAL?!?! He's been completely unproductive. How is it Malkin has four points, Neal has three, and the other forward on their line has zero? Worthless. The Tangradi project has run its course. He's had ample opportunities to make a presence at the NHL level, and continues to fall short. It won't be long, I hope, for him to run out of track in Pittsburgh and give someone else the opportunity they deserve. Paging Beau Bennett. How many times have the Penguins let opposing teams get back into games when in control? You could see the Flyers gain momentum in the second period on Saturday and the Rangers come on strong in the third period last night. Keeping the pedal down, foot on their neck, however you want to call it, the Penguins just can't do it. Knock on wood it hasn't cost the Penguins too many games, but it's a habit HCDB needs to shake. Dumb penalties. Three interference calls vs. Flyers. Brandon Sutter using his hand on the faceoff. Cooke getting caught retaliating. Use your brains boys. Dustin Jeffrey was one and done centering the fourth line. Joe Vitale looked comfortable and made smart plays grinding it out there with Tanner Glass and Craig Adams. That's a solid fourth line. Jeffrey wasn't sharp at Philadelphia and made some mistakes. He needs to clean up his game some. I've seen highlights of Tangradi at the AHL level, and I've seen him on the ice at the NHL level in person and on TV. IMO, his skill level better suits him in the AHL. I mean it's the exact same system used in WBS and Pittsburgh. You can't make any excuse why he performs in the AHL then falls asleep at the wheel when called up. As I admitted, I am a fan of Bennett. But even if it's not Beau, someone is more deserving than Tangradi to wing with Neal and Malkin. Paul Martin was awarded the goal in Philly. So, he now has 1 goal 2 assists. I think Tang deserves a chance to play 10 games in Pitt, but i do not disagree Beau would be a better fit, in the AHL Tang had more goals ( not by much) and Beau had more than double the amount of assists that Tang had, i think Beau would fit the second line better all day, if and only if he could thrive at the same level in the NHL, he is quick enough to keep up with Geno and Neal, but he would need to be more defensive then he plays now. I agree that their are more suitable players to be the 2nd line wing other than Tangradi, but i would hope they dont send him down to WB on less than 7-10 games. Also i wanted to ask, didnt know if you were able to make it to Hershey for the Outdoor classic, 5 of us made the trip down and took some pics, didnt know if you would want to check them out to see if any could be used...?